BigPipe customers - Any UFB customers care to review? Forums › BigPipe › BigPipe customers - Any UFB customers care to review? I am currently a Snap customer with a 200/20 plan with unlimited. 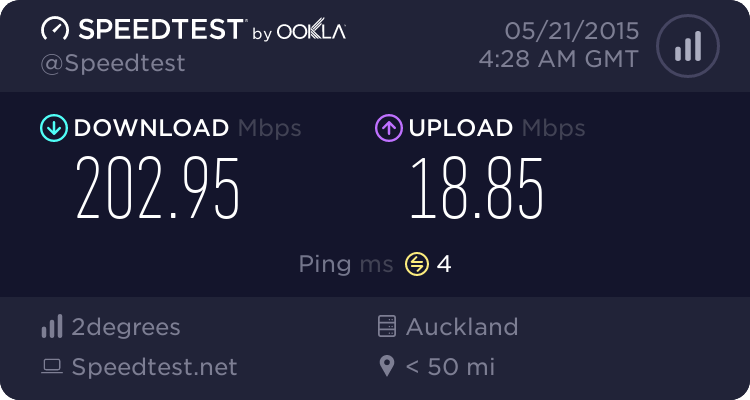 While my connection is pretty sweet i get great latency and good speeds the customer service has something to be desired and i can save afew bucks by switching to BigPipe, I was wondering is there any UFB BigPipe customers who can vouch for them in terms of game latency and speeds? I mainly play league of legends and diablo3 so prefereably someone who plays these games would be great info. I don't play those games but I'll offer my 2c anyway as a general user, streamer, and console gamer: connection is rock solid. I'm on 200/20 and speeds are consistently fast and latency is low too. You should get a similar speed and latency as you've posted, so why not switch and save money? Plus there's no contract with them either. I've been with them since they first started trialing UFB in July last year having switched from Vocus. Their support has been fantastic, and they certainly have made continuous performance improvements throughout the year. I'm only on a 100mbps plan but can easily max it out when downloading a single popular thing. Best ISP I have been with. 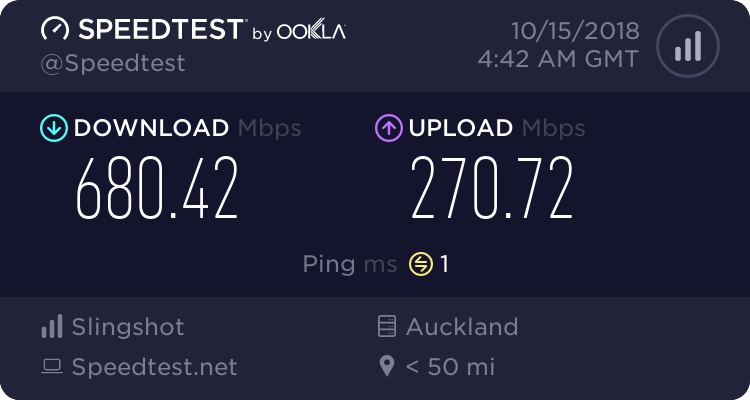 No complaints about speed, I'm on the 100/20 plan. Not a gamer or heavy downloader but quite pedantic nonetheless. Setup was a breeze, one-off for Static IP is awesome, no contract and a free month on sign-up was the icing on the cake. My only complaint (and its not really a complaint) is that I need to use PPPoe and have an MTU of 1492, where with VF I could just configure DHCP client on interface and have an MTU of 1500 (saves stuffing around with MSS settings on enterprise kit with VPN's etc). chrispchikin: Best ISP I have been with. So you have to use 1492 MTU? Does that mean you have to change it on the LAN side of your network as well, or just on the WAN side? What is the effect of having 1492 MTU as opposed to 1500? I had a read about online, but couldnt get a definitive answer. Based on what was said here, theres mention of PPPoE only supporting a max of 1492 MTU. Yes, using PPPoE adds another 8 bytes to the header size, so biggest packet you can fit is 1492 bytes. chrispchikin: Yes, using PPPoE adds another 8 bytes to the header size, so biggest packet you can fit is 1492 bytes. Hmm, that will be interesting to see that. I presume this is normal for all UFB services then? Not unique to Bigpipe? Yep, I'd say will be the case with majority of providers out there. Although when I was with Vodafone they didn't use PPPoe (Just needed to enable a DHCP client on the interface to get an IP address).